Moshi Moshi's vegetarian competition last year, which saw some of Brighton's best loved restaurants compete to make the best veggie maki, was a fantastic, memorable evening. 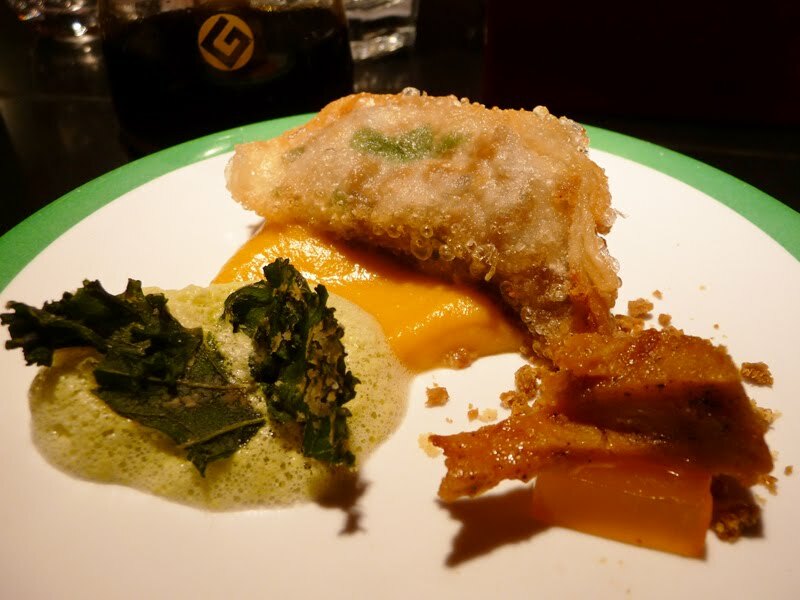 But this year was bigger and even better and saw the likes of Hotel Du Vin, The Chilli Pickle and Aloka go head to head, one step further, in a vegan maki comp. One one hand it's interesting to see restaurants from different cuisines putting their own twist on a single theme but really what this exercise is about is Moshi's ongoing, and genuine, campaign for sustainability and fish stock reserve issues translating not only onto options on their menu, but art exhibitions (with Rankin no less), events and campaigns as part of their long term plan. Something that all restaurants, not just sushi/Japanese restaurants should be taking on board for sure. Anyway, the entries this year were beautiful, intriguing and surprising. You will also see a lot of references to "duck" which may seem odd for a vegan event, but Moshi are also looking at alternatives for their meat as well as their fish ingredients. Hence the duck and cheese used for the evening was from The Redwood Company who specialise in "plant-based vegan alternatives". Some may find that hard to swallow but the proof of the pudding, as they say, is in the eating. My favourite (no surprise) was the Chilli Pickle's innovative "Duck" Chettinad Maki with Mango and Coriander sauce and hot, hot, hot chilli chutney. They really made this their own and everyone guessed straight away it was theirs. 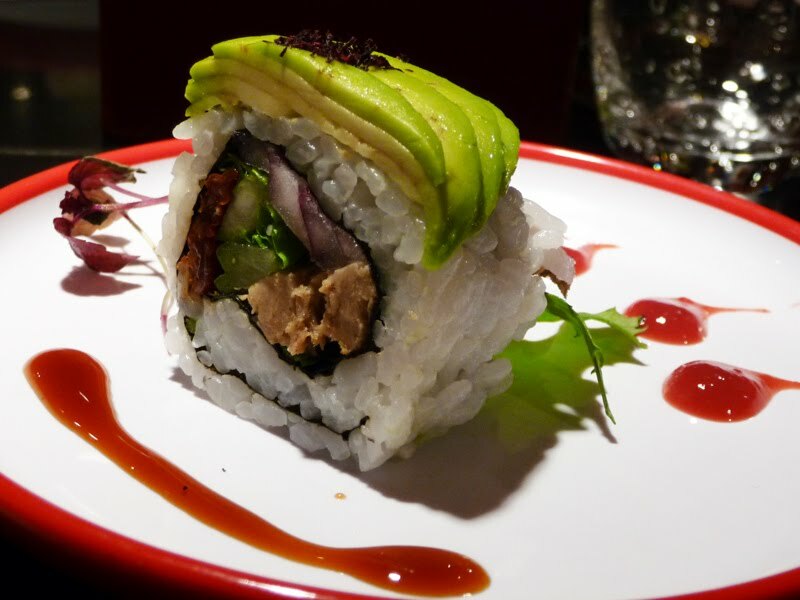 Is Indian Maki a step too far in fusion? Nah, not when it tastes that good! Hotel Du Vin really surprised me with their Crispy "Duck" in Spicy Broth and Fried Glass Noodles. 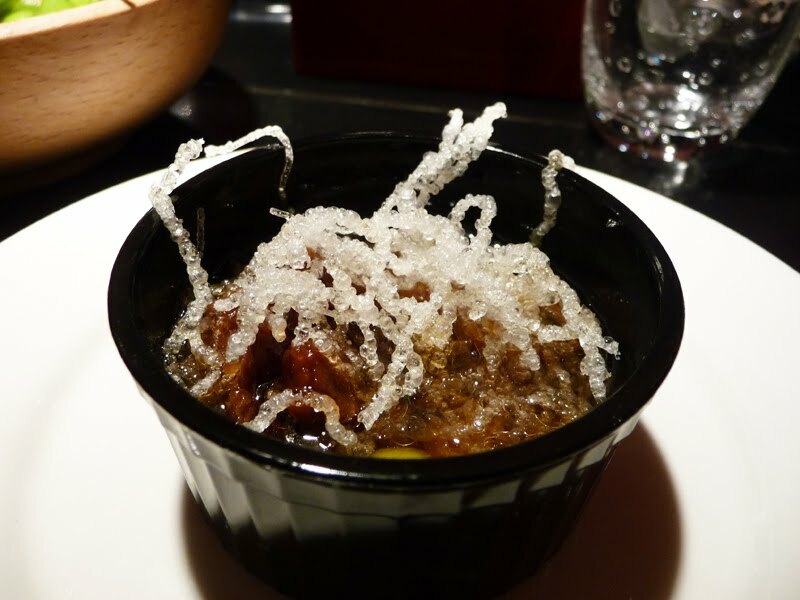 Texturally the most interesting and I would have happily swallowed a bucket of the dense, umami rich broth. (Hang on, this wasn't maki, a little cheeky, but anything that delicious will get away with a little boundary breaking.) The "duck" seemed the most duck-like in this if that makes any sense at all. Aloka put forward the most beautiful example (top image) and surprisingly (as they are by nature a raw/vegan restaurant) by far the one that experimented the most in creating a really "meaty" dish. Again, as is their style, there were may components and a few contentious textures. The ball of minced "duck" was quite convincing if a little over salted, but I think the raw product is quite salty to start with. The dehydrated lotus root was intensely, well, Bisto-ey. 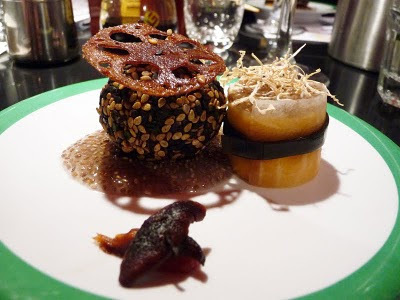 I couldn't quite make out the rest of the components, the fruity, possibly grapefruit or goosebery jelly was too unusual for most palettes but the squash wrap with (I think) dehydrated parsnips on top was an interesting textural contrast to the minced duck. Sparking the most debate, I think this was the most boundary breaking which I respected. Everyone loves Gyoza, and these, from Cashew (a vegan, raw and vegetarian catering) was a really nice example, filled with "duck", mushroom and vegan cheese. The squash and miso sauce complemented the dumpling and as much as foams irritate me, the wasabi foam actually suited the dish here. There was also a sweet chilli jelly. The only component I didn't really like was the "chicken" goujon which was a little dry but a small point for a small component. Most worthy of a good place (for sticking to the brief!) 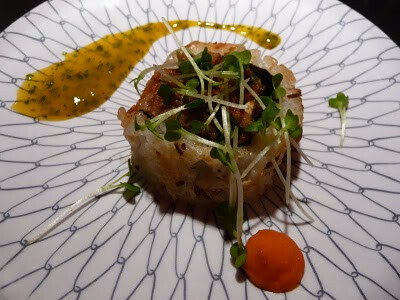 was Moshi's own "Duck" Maki. The avocado top gave the maki a fresh touch, the micro herbs were delicious and the strawberry puree, although unusual, worked really well. As a mouthful, one of the most successful. 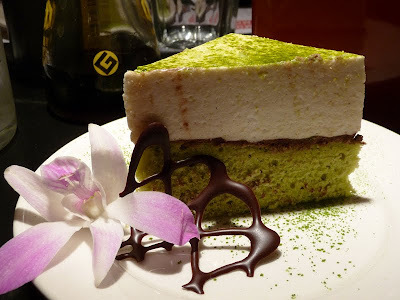 After once ordering a "Thai Surprise" and getting the most foul green jelly once, I've always been wary of green wobbly desserts from Asian cuisines, yet the VBites vegan cheese cake was rather pleasant. The Green Tea and Almond cake base was a touch dry but the Jasmine and Green Tea mousse was light and happily, not too sweet. If you like matcha based desserts, then this would be one for you. Was I convinced on the vegan meat alternative products? Well I think in maki, they are a small component by nature, so not chomping on hunks of the stuff, I think they are surprisingly convincing and I'd be impressed in a blind test anyone noticing who was unaware of a swap. Even the vegan cheese in the gyoza and sauces was good although the slab of the Redwood Company's "mozzarella" used by one entry was texturally and taste-wise not liked at all on our table. Incredibly salty and quite synthetic. Shame as the rest of the dish was great! However, having the choice of these products in a restaurant based on your beliefs and opinions on meat sustainability is fantastic, especially for Brighton's captive audience. So after the score cards were handed in, what were the results? Third place went to Moshi for their Duck and Avocado Maki, second to Hotel Du Vin for the Crispy Vegan Duck Soup and first place to the wonderful Chilli Pickle for their unmistakable stamp on their Duck Chettinad Maki. Fantastic evening and if they go ahead again next year, do try and make this event or try one of their other events and tastings that run throughout the year. Thanks to Moshi Moshi for yet another eye opening evening.